Gullies cut into the Russell Crater on Mars are revealed by the Mars Global Surveyor. New research reveals that sand propelled on a cushion of carbon dioxide gas could be responsible for slicing into the red planet's surface. 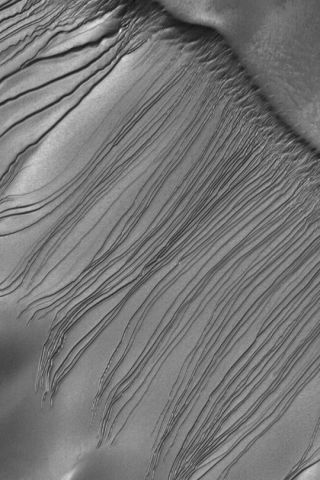 Gullies crisscrossing the Martian poles could be formed by carbon dioxide rather than by liquid water, a new study finds. Using calculations taken from industrial applications on Earth, scientists determined that frozen carbon dioxide on Mars could move the sand or dust piled on top of it as it vaporizes. In the spring, the Martian frost is heated enough to shift the overlaying sediment down steep slopes, gashing the surface like water running downhill. While gullies scar steep slopes and craters at the polar caps of Mars, such regions have been too cold, even in the past, to allow for liquid water on the surface. The polar surface, which is often covered by layers of Martian dust and sand, is made up of frozen carbon dioxide and water. The vapor lifts the sediment off the surface, reducing the friction and allowing the dirt to move more easily. "The air provides a cushion so the particles don't stick to each other and stop moving," Allan Treiman of the Lunar and Planetary Institute in Texas told SPACE.com. Treiman worked with Yolanda Cedillo-Flores, of the Universidad Nacional Autonoma de Mexico, to determine that sublimation could move sufficient dust and sand to create gullies. "It's most likely to happen in the spring, when the polar slopes warm up," Treiman said. Before the carbon dioxide can sublimate, the frost must dip to minus 108 degrees Fahrenheit (minus 78 degrees Celsius). Such a temperature depends on not only how little sunlight strikes the surface, but also how much sediment is on top of the frost. "When you get a thick enough layer, the sand acts as an insulator and the sun can't get through," Treiman said. A warmer region with a thick layer of sediment might not sublimate, but a cooler region with a thin layer could result in gullies, according to the team's calculations. The team used equations relied on by industries that constantly move small bits of matter. A company that needs to move corn or grain from a silo, for instance, might add air to keep the particles from clumping. Coal and pharmaceutical businesses also rely on air to keep things moving smoothly. The companies use an equation to tell them how much air to introduce. Cedillo-Flroes' team worked backward to calculate how much carbon dioxide was needed, then determined that the temperatures on Mars could support such flows. Because the Earth is warmer and wetter than the Red Planet, such processes rarely occur naturally here. Instead, loose snow on the surface of an avalanche might mix with air, creating a slurry that slides rapidly down mountains. And in China, which boasts dust from glacial times, earthquakes can lead to large dust flows that are lifted by air. "They look like huge molasses flows," Treiman said. Still, even these processes are the exception, not the rule. Particles on Earth tend to bond. "There's just enough water in the atmosphere to make them stick together," Treiman said. Besides, "it's never cold enough for carbon dioxide frost," Treiman said. The processes may be rare on Earth, but Treiman thinks they are good candidates for solving the mystery of gully creation on Mars. "It's a way of explaining ... the ones at the poles, where there's no hope of finding water," he said.